This charming scene depicts two ladies of repute negotiating their way around Hyde Park Corner on their way to Hammersmith. 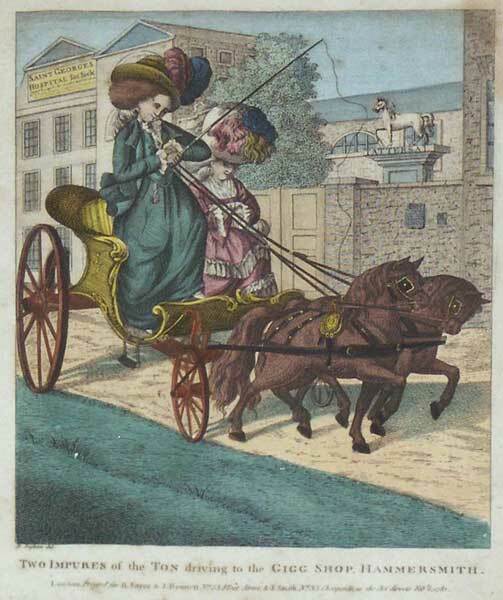 The ladies are passing by Saint George's Hospital for the Sick (now The Lanesborough Hotel) and the syphilis spots on their faces suggest that they might have been visiting the hospital for a consultation! Also in the background is Tattersal's, the leading bloodstock auctioneer founded by Richard Tattersall in 1766. This may be an oblique reference to the fact that both the horses and the ladies are up for sale. Robert Dighton (1752-1812) was one of the celebrated band of caricaturists working in London during the Regency. His beautifully hand coloured etchings are considered amongst the best examples of his genre and much of his work concentrated upon the colourful characters that thronged the crowded streets of Georgian London.